JKS does a funny little dance at Bangkok airport. 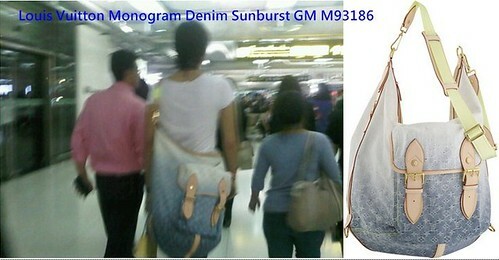 Jang Keun Suk departs for Korea on the 12 Jan, 00:30 hours flight. Q1. What are your feelings towards this Ole event? 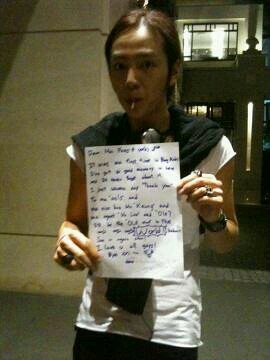 JKS: It is my 1st time in Thailand. I feel nervous. Thanks to all friends who came today. This Ole event is a stage for more people to know me. I feel happy. We finished the commercial yesterday, and had a happy collaboration. Q2. How was the filming atmosphere yesterday? Any interesting incidents? He introduces himself as Jang Keun Suk from Korea. When asked what he likes best in Thailand, JKS said he came for work and did not have much time for leisure. He went to a shopping centre but there were too many fans, so security asked him to leave. He thanks fans for their warm welcome at the airport. He did buy a bag at the LV shop the day before; it was the only one of its kind in Thailand, and he feels very happy at his purchase. He jokes that he has to start eating instant noodles from that morning and he feels hungry! JKS has been working without a break since 31 December, but he feels happy about eating delicious food in Thailand, such as somdum. 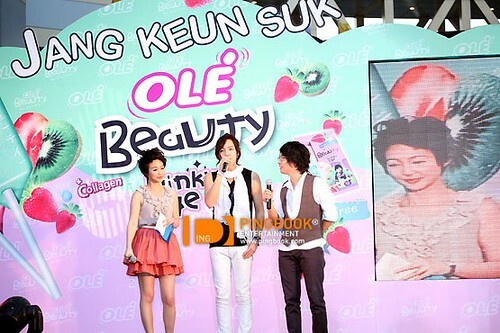 Being a fun-loving guy, JKS jokes with the interviewer and makes fans laugh. He tells the interviewer she is cute, and then says that is a joke (!). After that, he says the whole thing is a joke (!). Not that I’m in favour of MuGyul-Jung In shipping, and also allow me to clarify on behalf of the guys that they are not gay either. Just that this MV is well edited and brings out another romantic plot that is different from the original drama. The song matches the MV too. Anyway, so long as it has Jang Keun Suk in it, I’m happy to watch. Most of the interview is conducted in hopefully understandable English except for the Thai and Korean self-introductions. Jang Keun Suk shares some of his plans for 2011, including a commercial in Korea, resuming his studies, travelling again to Japan (should be in Feb 2011) and China, and shooting his new movie. And also his Asia Tour in Thailand, possibly in April!!! Jang Keun Suk has very sharp eyes indeed. In such a crowd, he can spot that his name was written wrongly on a fan’s board, and he walked over to the fan to correct his name! If I were the fan, think I’ll faint if JKS walks to me!! Super long post, but it provides an insight into Jang Keun Suk’s background and current website situation. Tree-J Company has made an announcement recently on JKS official website to advise official members NOT to re-post (original or translated) information, posts and videos etc outside of their website. After knowing this, I deleted my translation of JKS’ blog post (dated 6 Jan 2011) from my blog as well. The notice caused an uproar and a divide among eels, some of whom think negatively about this new “guideline”.